Researching and selecting the best garbage disposals is not exactly a glamorous job but it’s one which, if done right, will provide a higher quality of life for everyone who lives in your home. Keep a couple of things in mind before you dismiss that statement as hyperbole. First, cheap garbage disposals have a habit of developing leaks. If you’ve ever experienced a leaky garbage disposal you know just how nasty that can be. Second, cheap disposals tend to be loud. We don’t know about you, but the sound of grinding garbage echoing through the house isn’t something we want to live with on a daily basis. And third, cheap disposals tend to do a lousy job of breaking down solids into small enough pieces. Consequently, larger bits rot in the disposal creating a perpetually awful smell. There are other reasons you’ll want a top quality garbage disposal, and we’ll get into those below, but for now, let’s get started on our reviews of the top 5 garbage disposals. No hassle installation: The Waste King Legend 8000 comes with everything you need for a fast, hassle-free installation including an easy mount system and comprehensive instructions. Jam-Free operation: The Legend 8000 is a beast, although a quiet beast to be sure. You can continuously feed this gentle giant while running and you’re likely to never experience a jam. The 1 HP motor will reduce the toughest broccoli stumps to broccoli dust in short order. Oh, the power! : The Legend’s 1 HP 2,800 rpm motor is plenty energy efficient but also provides more gnawing power than almost anything else on the domestic market. It’s truly a marvel of contemporary engineering, providing you maximum function while making minimum impact on your energy bills. Corrosion-free operation: The grinding chamber of the Legend 8000 is made from glass-filled nylon which means you can operate it for the rest of your life and never have to worry about corrosion. Fully insulated, stainless steel grinding components mean you’ll also experience an ultra-quiet grind. Septic tank compatibility: Lesser quality disposals can create significant issues in homes with septic tanks. The Legend 8000, however, is completely safe when partnered with a properly sized septic tank and will never produce the kind of oversized waste that can cause septic tanks to clog. First class warranty: The Legend 8000 comes with a lifetime warranty against corrosion and a limited mechanical warranty that isn’t really so limited. By that, we mean that it’s only limited by your lifespan. If the Legend develops a defect at any time after you install it, up to the time of your passing, Waste King will replace it free of charge. Some of the other disposals on this list may be essentially equal to the Legend 8000, but none can be said to be measurably better. Just a great disposal all around. 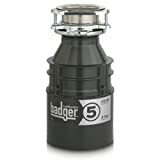 The Badger 5 garbage disposal – aka the InSinkErator Badger 5 – has been around for some time. That can be attributed to the fact that people tend to support product lines that actually do what they’re supposed to do. InSinkErator is, in fact, the only brand of garbage disposal currently manufactured in the USA and not only that, but it’s also the best-selling garbage disposal in the world as of this writing. Ease of installation: Every InSinkErator features Badger’s Quick Lock sink mounting system. If your home already had an InSinkErator installed all you need to do is twist off the existing one and twist on the new one. It’s that simple. Any InSinkErator model can be installed or replaced in this manner. A major plus for DIYers. Free house calls: With Badger’s limited 2-year in-home warranty they’ll come to you to effect any necessary repair work; parts and labor included. Badger disposal maintains a network of some 1500 service agents across the country so if you experience a problem within 2 years of installing the Badger InSinkErator, call their toll free number and help will be on the way. ½ HP motor: While not as powerful as the Waste King Legend 8000’s motor, the InSinkErator’s ½ HP motor should provide plenty of teeth for just about any situation. What’s more, InSinkErator has been at this so long they’ve got this motor thing down to a science and the power plants they provide typically durable and highly efficient. 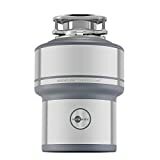 When reliability at an affordable price is of primary concern to you, look no further than the Badger InSinkErator ½ HP garbage disposal. In truth about the only thing, we weren’t happy with when it came to the InSinkErator was the fact that it came without a power cord. Why? Would it really inconvenience Badger that much to include a power cord and bump the price a buck or two? We think not. Here’s hoping the company has a change of heart about this issue. Like its big brother, the Legend 8000, the Waste King 2600 has an array of desirable features including stainless steel grinding components, a first-class sound insulation system, a grinding chamber that will never corrode and much more. 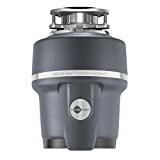 Also like its big brother this Waste King garbage disposal is a continuous feed disposal that can take just about anything you toss down its chute. Trouble free continuous feed: Like the Legend 8000 2600 is a continuous feed disposal so you can continue to add food waste while the unit is running without worry. The unit runs remarkably jam free compared to most other units, and that can be attributed to the quality of its stainless steel swivel impellers. Quiet. Oh so quiet: Those same stainless steel impellers are fully insulated so the unit is one of the quietest you’ll experience. In fact, there may be times someone will be running the 2600 with you in the room, and you won’t even realize it. Ease of installation: Like all Waste King products the 2600 features no hassle installation with their easy mount system. All necessary hardware to complete the installation is included as is the requisite power cord (are you listening InSinkErator?). 5-year warranty: Where the Legend 8000 and the Legend 2600 diverge (besides the size of the motors) is in the warranty coverage. Both feature a lifetime warranty against corrosion, but the 2600 has a 5-year warranty against product defects (as opposed to the lifetime warranty against defects the 8000 boasts). The Waste King 2600 is an incredible value that provides you many of the features of the superb Waste King Legend 8000 at a more affordable price point. It’s arguably the best garbage disposal for most situations. Quiet operation: InSinkErator has put a lot of time and effort into soundproofing their disposals, and the Evolution is the beneficiary of those efforts. Sound mitigation technology includes an anti-vibration mount, copious insulation around the motor and an anti-vibration tailpipe. Add this all up, and you have a disposal that runs smoothly and quietly in the background without imposing itself on your life. Easy installation: Like other Badger disposal models the Evolution comes with a quick mount system that allows for the twist on, twist off installation and removal. It doesn’t get much simpler than that. Any InSinkErator model can be quickly replaced with any other or any Badger-branded disposals as well. Toughness and Reliability: The ¾ HP motor means you can have confidence that the Evolution will be able to handle any type of normal food waste without jamming or leaving unchewed bits behind to rot in the grinding chamber. Foods are practically liquefied by the 2 stage action of the Evolution’s GrindShear Ring and Tri-Action Lug system. They-come-to-you warranty: If you experience any problems with the InSinkErator Evolution for up to 4 years after installation, the manufacturer will send a repair technician to your home free of charge to effect repairs. Accessing this service is as simple as calling the company’s toll-free number to find the authorized repair agent nearest you. We like this. The InSinkErator Evolution ¾ HP disposal comes with (almost everything) you need, including Quick-Mount system, Jambuster wrench, sink baffle, anti-vibration tailpipe mount, full installation instructions and more (except of course the power cord). Powerful 1 HP Dura-Drive Motor delivers reliable long life and trouble-free operation. MultiGrind Technology that produces 3 stages of grind, so you never have to worry about unprocessed materials at your disposal. Ultra soundproof operation that won’t drown out your conversations or wake up the kids sleeping upstairs. Breaks through tough materials using Jam-Sensor Circuit technology that automatically increases engine torque when needed. Generous 40 oz was grinding chamber with stainless steel components lets you process more materials in less time. Easy installation using InSinkErator Quick Lock sink mounting technology. InSinkErator full 7 years in home repair warranty covering parts and labor. Designed and built in the USA and this disposal easy to clean. About that warranty – InSinkErator covers all their disposals with different versions of their “we come to you” warranty. In the case of the Evolution Excel, they offer their maximum protection in the form of 7 years of in-home repair coverage on parts and labor. Should you experience a defect or other problem with the Evolution Excel at any time up to 7 years after purchase, all you need to do is call their 800 number to arrange for one of their more than 1500 network repair technicians to come out to your house and fix the unit. The InSinkErator Evolution Excel is the one domestic garbage disposal that can truly claim to be the equal of, if not superior to, the Waste King 8000. As long as they’re making you go through the hassle of purchasing the power cord separately, they won’t be able to claim top dog status all by themselves. That said the Evolution Excel does a bang-up job and does it quietly and dependable. What more can you ask than that? Continuous feed disposals: With continuous feed disposals you can feed waste into the unit while it’s working. This is a big time saver and also saves you having to reload and reactivate the disposal repeatedly as you would with a batch feed disposal. As we said, the vast majority of disposals installed today are continuous feed. Batch feed disposals: The batch feed disposal is so named because you feed a ‘batch’ of material into the disposal and then activate it by inserting a special plug or using a magnetic cover. This is mostly a safety feature and actually, makes batch feed disposals a viable choice for homes where young children are present. Type of system: There are two main types of garbage disposal in use in homes today. They are batch feed and continuous feed. There’s no doubt most homeowners today choose continuous feed disposals, but batch feed still has a place. Your volume needs: If your kitchen is a busy one, where large numbers of people (either family or friends) regularly gather to eat, you may want to consider a 1 HP disposal simply because a standard ½ HP unit may burn out quickly or simply not be able to adequately process all the material you want it to. Wear and tear on the grinding components is another issue since frequent heavy use will quickly wear down lower quality hardware. Price: Garbage disposal prices will run anywhere from about $80 to more than $400. But you really can’t let garbage disposal cost be the determining factor when it comes to disposals. Much more important factors are how often you will use it and what type of volume you’ll expect it to process. If you buy a cheap garbage disposal just based on price and run it hard, you’ll wind up having to replace it in short order. Is there a septic tank involved? There are some who would argue that if you have a septic tank, you should not have a garbage disposal. We think this is an overreaction to any potential problems. Certainly, if you have a septic tank, you’ll want to make sure your garbage disposal won’t generate so much food waste that the septic system becomes clogged. Likewise, you’ll want to be sure the disposal does a good job grinding materials into the tiniest possible particles; which means you’re probably going to want a 1 HP unit that will practically vaporize whatever you put into it. The Bottom Line: Keep the above in mind when shopping for the right disposal, and you shouldn’t have any problems with the unit you eventually install. The long-term health of your septic system: Septic tanks may seem indestructible but they’re not. They’re actually delicately balanced systems that can be thrown out of whack without too much of a shove. A high-quality garbage disposal unit will make sure nothing goes into the septic tank that it can’t handle. The long-term value of your home: The wrong disposal can create a cascading series of issues with the septic system. If this should happen the value of your home could take a significant hit. Cranky septic systems often drive away prospective home buyers who are loath to take on the expense and responsibility of fixing or even replacing the septic system. And all of this because you chose the wrong garbage disposal. Your long-term peace of mind: Who wants to be worrying about or paying to repair their garbage disposal all the time? Who wants the smell of rotten food the disposal couldn’t process wafting through their home? Who wants a cheap disposal that’s so loud when it’s running you can’t even hear yourself think? If you said ‘nobody’ we’d have to give you an “A” on that short test. Buy a high-quality garbage disposal like Kitchen Aid, General Electric that’s appropriate to your septic system (if you have one) and put the issue to rest. The difference between a cheap unit and the best garbage disposal is only a couple of hundred dollars, and it could save you thousands of dollars in repairs down the road. Garbage disposals aren’t like space shuttles. They don’t take hundreds of engineers millions of man-hours to design, produce, test and roll out. They’re pretty simple machines. You install them, plug them in and put them to work turning food waste into something manageable for the town’s sewer system or your own septic tank. Because the concept is simple there are just 2 types of disposals at work in most homes today: the batch feed and continuous feed systems mentioned above. Let’s take a quick look at the benefits and potential drawbacks of each. A Popular Choice? Today less than ⅕ of garbage disposals sold are batch feed disposals, mostly because they’re just not as convenient as continuous feed disposals. Easy to Use? Not particularly. That, however, is actually a good thing if you have young children in the home. Major Advantages? As mentioned the major advantage of the batch feed disposal is that it’s not easy for kids to accidentally activate. Most have a stopper as well that prevents things (like toys for example) from accidentally falling into the disposal and causing problems. Most batch feed disposals usually come ready to simply plug in and use. Disadvantages? Not so easy to use. Takes longer to process the food waste. A Popular Choice? Far and away the most popular type of disposal yet invented. Easy to Use? Extremely. Simply flip the switch and start feeding it. Continue to feed it while it’s working until all your food waste is processed. Major Advantages? Much easier to use than batch feed systems. If you’re dealing with lots of waste you’ll process it much faster with a continuous feed disposal. You can continue to add more food waste as the unit is running. Easy to maintain. Disadvantages? The major disadvantage of this type of kitchen disposal has to do with kids accidentally dropping toys etc. into the disposal when no one is around and trying to retrieve them by sticking their hands into the unit. With some brands, you also have to purchase the power cord separately. …should do you well from the minute they’re installed and continue to provide you reliable service for years to come due to the quality of their construction. 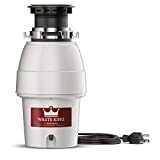 So do slight research on the best garbage disposal and you can lastly enjoy a cleaner with the new professional environment that is secure for the complete family.